I’ve just added something new to the “Bucket List” of my life. And, you may think I’ve blown a fuse. I’d like to have – if only once – a Christmas tree in my front yard that makes the mouths of children drop, the eyes of moms sparkle, and be the envy of every dad within a fifty mile radius. Once. That’s all I ask. 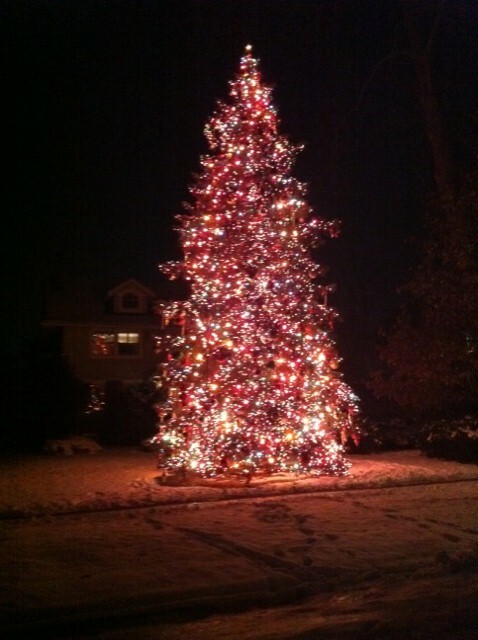 I want a tree like the one in my neighbor’s front yard. It’s a few blocks away. It’s breathtaking. Seriously. I’ve seen the Grand Canyon. I’ve set my eyes on the Mona Lisa, the Golden Gate Bridge and even the Olsen twins. When they were little. But this tree is like nothing else I’ve seen. It beats any tree at Macy’s or the good old days of Marshall Fields’ Oak Room. Why, you might ask? Folks, it’s in someone’s front yard, for goodness sake! It blows my mind away year after year. And, every year-while I delight in her shining glory-I’m reminded of how pitifully simple my lights are. Which is fine. For now. But one year, I want the show. I want the glitter. I want cars to stop. I want to be the house with the magic. Eight strings of light just doesn’t compare! Hey goodfather! Thanks for the comment. Maybe NEXT year we'll both have our wish! Happy Holidays! Sounds like Battle of the bulbs. There is always a great movie on this time of year where men battle it out to have the most out decorated house on the block. I love that bucket list item. I don't have it in me to compete, but I certainly love adoring everyone's lights this time of year.